“Oh to be clean…” a quote from John Frye’s blog entry “seeing Jesus through a lepers’ eyes.” I think sometimes I take it for granted, forgetting how dirty I really am and in doing so taking for granted what it is to be clean. A lot of time things are only skin deep for us. We see that we’re ok because we don’t do bad things and everything we do is justified. We see our problems being simply what we do or don’t do. Everyone else is so evil and we’re so good. We wear a mask to cover up the real distortion in us, the real dirty places in our lives. Doing bad things is only the symptom of a much deeper distortion. It’s when we see that the problem is in our soul that we realize how dirty we really are. It’s easy for many of us to think that we’ve arrived, we’ve been cleaned up and we’re ok now. Our need for Jesus is replaced, in our agendas, by His “need” for us. We begin to think that the world revolves around us. God wants to use us, God needs us. So we “witness” and we throw the bible at people because if we don’t they’ll go to hell. When we reveal or allow Him to reveal our souls, the dirty, grimy, scarred, hideous places we realize how incredibly much we need Him. So He heals us cleans us and we understand how beautiful it is to be clean… “oh to be clean.” What if our actions, instead of deriving from His need for us, came from an understanding of how hard it is to be dirty and how amazing it is to be clean? What if we remembered how much we need Him? Those who know pain respond to it, those who’ve been ill heal, those who’ve been lost find. We declare the kingdom of God because we do not undervalue what it is to really be dirty and long to be clean. Allow God to peel away the mask. Our God seeks the lost and the distorted. Nothing we’ve done can exhaust or exclude us from the love of God. Why are we so afraid? You have such a way of thinking and putting things into words. This is such a great post. I should have guessed when you kept asking where the symbolism is that you were formulating a blog post. I think it is so important that we allow for God to peel away the mask. Beautiful post Wes. Your amazing! That was much to think on. We need to always think of our motives our intentions...in everything, if it is in anyway about us or something that "we" can get out of it, we have taken our Lord off the throne and put ourselves there. It is interesting to me lately that I think almost everything that I watch...God shows me something. I have one soon I will post on Forest Gump==I love him! People will not like us if they see behind the different masks we wear: the church mask, the job mask, the school mask, the friend mask, the lover mask. 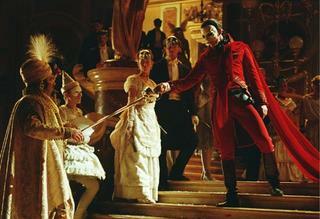 We wear the masks because we fear rejection and abandonment; that we will end up alone, as did the Phantom. We are all disfigured. We are all scarred and maimed. We would weep with one another and embrace one another if we could only see that we are all alike in this. I need to see another person scarred like I am to know that she will truly understand my pain, and lead me to the Healer. We are to use our 'disfigurements' to speak into each other's lives. But do we dare? I believe many wear masks because it's the way they handle everything in life... they attempt to fill an inward void (usually God-shaped) with an outward means. Some cover the condition of their heart with materialistic things, some with food, some with plastic surgery, some with frivolity...etc. No matter what is going on inside, it will only be dealt with on that level. That is the power of the song Wes originally referred to. Since we know the ugliness of our hearts, we assume it can be seen on the outside, when in fact, the Bible tells us that man looks on the outside, but God looks on the heart... and He's the only one who can fix the real issue of distortion in our lives. A favorite part of mine, even though it is somewhat a matter of debate in my mind is in the Phantom's lair, the song the Phantom, Christine, and Raoul sing together. Christine sings "God give me courage to show you, you are not alone!" Like what has been posted before, we all wear some sort of mask, to hide the hidiousness we see inside. The danger is in becoming so consumed with being someone else that you allow your real soul to shrivel. I keep pondering his reaction to her kiss, he cannot accept this unconditional love. His self perception has distorted to the point where he cannot accept redeeming love. At least, that is one part of what I think, there are other issues that contradict this somewhat. But I think people can become so absorbed in their own disfigurement, real or imagined, that they cannot look beyond it to comprehend and accept the healing and forgiveness of God.